People call her Nining, a combination of Earth and Fire elements. Nining finished her study at Accounting Faculty of Economics Gadjah Mada University. 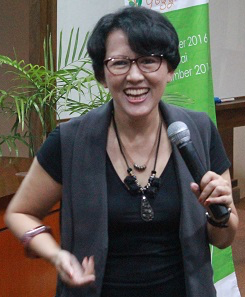 Prior to engaging in consultation and training, Nining was an Auditor at Astra International, a multi national company in Indonesia, with the last position as Head of Audit & Standard Operating Procedures. Since 2000 Nining has established and managed INOVASIA – Consulting, Training, Team Building and Organising with clients of national & multinational companies such as Pertamina Hulu Energy ONWJ, West Madura Offshore, Star Energy, BP Oil Company, WorleyParson, Bank Indonesia, Sosro, Rukun Raharja, Directorate of Mineral Resources, Ministério da Educação Timor Leste, School Strada, Athalia, etc. Her journey as a Consultant, Trainer and Entrepreneur is a combination of exciting experiences to share to clients in managing careers, organisational development, dealing with competition, reduce conflict and building teamwork.